The Torchmate team took on a new look and growl for the 2010 race with a fresh wrap and exhaust system. The truck looked fast with a bright Torchmate Plasma Arc flying down the side, a special design by Bill Brindle of B3 Kreativ, Editor of Dirt Sports Magazine Marty Fiolka and Torchmate Team Owner Bill Kunz. Also before the race, both the Class 6 truck and the chase Ford Raptors were upgraded with a Magnaflow Exhaust “that significantly helped with the tone and performance of the trucks,” commented JT Taylor. With no flats on the BFGoodrich Tires for the entire race, the teams first obstacle was at RM4 when the torque converter failed, and while trying to get off course to get it fixed, they broke the rear upper link. Help was waiting at RM8 where they quickly fixed both problems and Greg Jones and Nick Socha continued in traffic, dust and fighting to get around stuck vehicles. Their next obstacle was a broken drive shaft around RM220. Mark Leverett and Brad Lovell went to assist them on course, with a local savior Pepe, who helped fix the truck. The team did an early driver change and with Leverett behind the wheel, they only had first gear and the check point at Coco’s Corner closing rapidly. At the end of their day, it was the harmonic balancer that failed which took out all the power units at the front of the car. 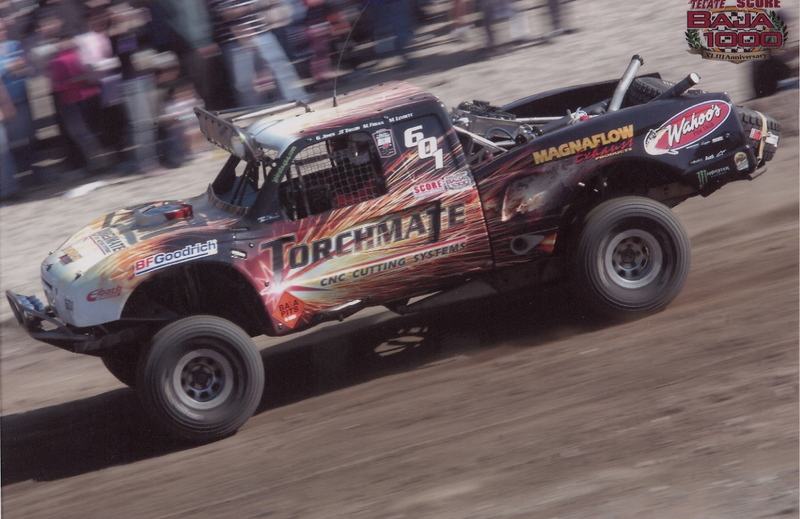 The Torchmate/Magnaflow/BFGoodrich team consisted of Bill Kunz, JT Taylor, Greg Jones, Robert Wilson, Nick Socha, Mark Leverett, Brad Lovell, Matt Magliacano, and Marty Fiolka.